Litobrancha recurvata is abundant in fewer places than other important Ephemeridae like Hexagenia limbata or Ephemera simulans, but where it does exist it has dense populations which produce good hatches. It's distribution is largely eastern, from Pennsylvania though the New England states, but it is reported for Minnesota and both Wisconsin and Michigan have good populations. They are also reported down into the mid-Atlantic states. Emergence begins in late May in Pennsylvania. Michigan and Wisconsin follow a week or so later and peak in June. The hatch may continue through July and even into August to the north. It only lasts from three to five days on a given stretch of stream. Stillborn: In fly fishing, a stillborn insect is one which got stuck in its nymphal or pupal shuck during emergence and floats helplessly on the surface instead of flying away. It is a specific class of cripple, although it is sometimes used interchangeably with that term.) or crippled. Emerger and cripple (Cripple: In fly fishing, a cripple is any insect which has been injured or deformed so that it cannot escape the water. This may include stillborn emergers or fully emerged adults which have been damaged, often by wind or waves, so that they can no longer fly. Trout often favor eating crippled insects.) patterns are recommended. 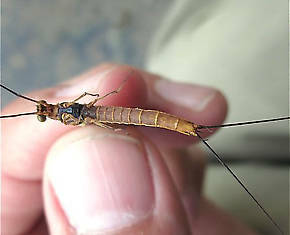 These mayflies return as spinners one to three days after hatching. Typically the duns from more than one day will return as spinners together, creating concentrated and exciting spinner falls. 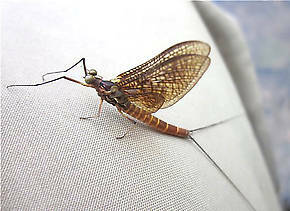 Spent (Spent: The wing position of many aquatic insects when they fall on the water after mating. The wings of both sides lay flat on the water. The word may be used to describe insects with their wings in that position, as well as the position itself.) patterns can be very effective when the females fall to the surface to lay their eggs. 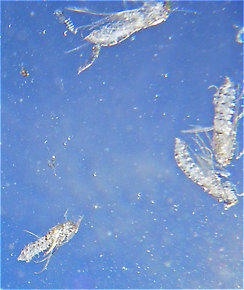 Caucci and Nastasi in Hatches II describe their experiments rearing these nymphs. They found that the grown nymphs, like other large burrowers, are extremely hardy, but the early nymphal stages are very sensitive to pollution or warm temperatures. They take two to three years to mature before hatching. Okay, I'm at a local TU meeting and a friend tells me about a double secret mystery hex hatch. According to him, these hex are colored differently than our limbata, hatch two or three weeks earlier for about 3 days only (last week of May or the first week of June), and exhibit some other "different" behavior traits. Needless to say, I was interested in learning more. Fast forward to this morning when I picked one of the nymphs up from his house after he dug a sample up for me to take home. Its still alive, so I'm trying to figure out what body parts I need photographs of to share here to see what you guys think this guy is. A quick look at the head and tusks is pointing me to Litobrancha recurvata, and the emergence period shown in Hatches II for them is about right (May 14 to July 3). The photo they have in their color plates looks very close to what I just finished photographing, but what I have looks different. I took a couple dozen quick photos of it and uploaded them to my flickr account, wasn't sure if it was ok or necessary to upload them all here. Link to the gallery below. Please let me know if you'd like me to upload any of these here, or if you'd like a better shot of a certain feature, so you can see the full res photo for better detail. In my non-expert opinion, I would say this nymph is near full maturity, as its ginormous. I can't find my metric ruler, but it is ~50mm long. Thanks for any help. Collected a couple of these last week. 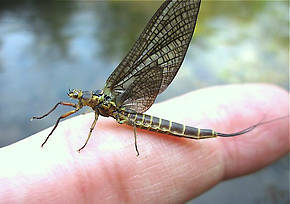 Pretty cool mayfly if you ask me! Caucci and Nastasi's comments and other comments above are correct. They are really hardy and impressive nymphs when they near maturity. 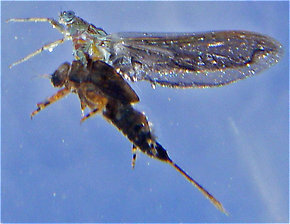 Litobrancha nymphs prefer fine silty, mucky habitats in streams. They can be abundant in mucky side channels to the main stream. Their emergence occurs over a 5-day span, with the large majority emerging within a 3-day period. Therefore, large emergences are rarely encountered. When they do occur, they can be very impressive. From my experience collecting and rearing these critters, they have a 2-year life cycle in PA and MD. They increase tremendously in size in their second year. Emergence occurred in late May into early June about a week before that of green drakes (Ephemera guttulata).